Bustamite crystallises in the form of masses and tabular crystals with rounded edges. The colour ranges from pink to raspberry to brownish-red and the specimens sometimes contains black manganese. 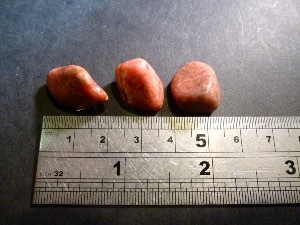 Bustamite has been recently found in Brazil in combination with Rhodonite. 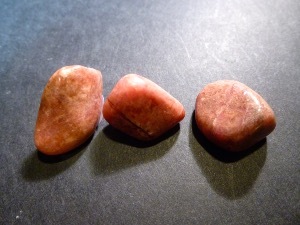 Bustamite is said to be a powerful stone invitation, movement, and stabilisation of energy. It’s believed by some to have successfully in the removal of energy blockages and in realigning the energy channels to their proper locations. It may be used to both activate and clear the heart chakra, and to provide calming action during stressful activities. Bustamite is member of the Wollastonite group, containing calcium manganese inosilicate. Tumbled to a smooth finish, an ideal pocket size stone, small enough to carry around with you. Tumble Stones can also be placed around the home for their energies or can just be nice decorative items. Selected specially for your order.